St Charles played host to Montana at the friendly confines of Crown Royal Stadium. The St Charles Sheens beat the Montana Pandas, 10-2, at Crown Royal Stadium. The Sheens got a fine performance from catcher Leroy Bates, who captured player of the game honors. 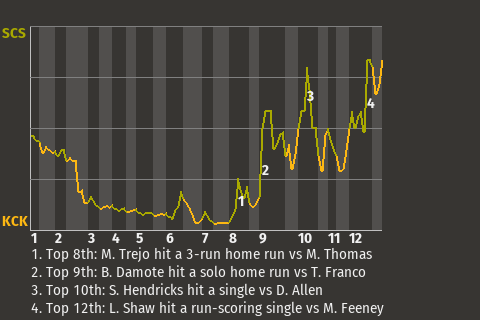 He was 2-4 with a home run, a triple, and a walk, while scoring 3 times and driving in 3. Mark Schlosser got the win, improving to 1-0. He worked 6 innings, giving up 2 runs on 6 hits, while striking out 2 and walking 1. Bates had a big at-bat with a runner on 2nd in the bottom of the third inning, when he hit a run-scoring triple. The Sheens went on to win. "We swung the bats good throughout the lineup," said St Charles skipper Luis Francisco. St Charles is still hoping to get on a roll. The win is just their 1st in 3 games. Special Notes: SP Mark Schlosser was injured while pitching.